Well Keith is at it again, digging up the yard. That man seriously can not sit idle. Whereas that is an attribute I favor it's just often too much to handle at times. Mostly because I am unprepared for his very GRAND plans. Generally come Saturday I am looking forward to having no work to do. Though I have come to understand that while I am busy all day he sits around doing office work and is eager to be active on the weekend. Since we are the reverse I have to rally and be ready to roll with all these plans. He has been talking about creating a tree circle in the back corner of the backyard. So talk turned to action quite suddenly. On Saturday after lunch he decided to proceed with the project. 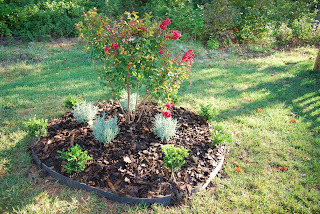 We drove to select the center piece, the crape myrtle, and the accents boxwood and lavender. He marked out the circle digging a small edging to begin his tilling. The success of this project rests on another separate project also on his list of GRAND plans. We have been wanting to install a flagstone patio between our house and garage since the first month we moved here. It's a poorly used area not fit for much and as he deems it a lousy chunk of grass he has to mow. What grass does grow is trampled as we walk from our drive to the back door. For me it's the only spot for an old English patio garden I find so appealing. Just like every project this one is going to be rather intensive and laborious. The first step was completed earlier this year and turned out great. I just didn't expect to move forward with the patio part this year figuring we'd wait until next year for more digging. Nope. No waiting. He needs a source of excess dirt to raise up the tree circle and this is the only reasonable source to extract the amount he needs to complete his plan. Before he began tilling up the patio area to produce his dirt I suggested that he not waste all that grass. There is a line along our driveway of weedy crabgrass that he killed with some sort of weed killer product. For over a week it has been a brown awful color that constantly reminds me of illness. I find it disturbing to look out the window and see such dead awfulness in sea of growth. Reluctantly he harvested the sod which he had hoped to till into the dirt. He dug up the dead weedy grass and replaced it with the healthy sod. Once all the sod was set he began tilling the dirt to build his tree circle. This man loves to till. He wasn't able to get much more done since the day was coming to an end. Sunday was where the action took place. While I was volunteering at the library he managed to complete the tree circle. The remainder of the day was spent tilling and removing dirt for laying the patio. All the extra dirt was moved to the backyard to build up a berm for blueberry bushes. Occasionally our yard gets a spring flood, well, actually it's the result of runoff. Anyhow every spring after a heavy rain there is a huge rush of water that flows downhill through the back most portion of our backyard. Anything in its way is run over and often washed away. By building a berm like structure we hope this will keep the blueberries from being damaged after the rains. This tilling and moving of dirt will take several weekends. There's so much to grade and then the whole problem of how to figure out the drainage will certainly keep us busy. By the end of October I hope it is complete. I doubt I'll be able to neglect helping for the next few weekends which means I'm going to be dreadfully beat for the next month. By now we've become quite skilled at setting patios it's just a huge task filled with a lot of "man-hauling" as Keith puts it. Regardless of the name you give it, the task is still huge and time consuming. I keep reminding myself that by "man-hauling" our own patio we're saving $10K. I just hope my body can keep up with the labor. That reminds me I think adding another mile to my daily walk is necessary for the endurance I'll need to maintain pace with this incredible "man-hauling" project. Here's the circle complete. He does nice work eh? It does look great. Just be careful. If either of you are injured it will cut into the savings. Is there a gym (or gym access) at Keith's firm? Eric's been playing squash at lunch.